Using a meat mincer to extract the juice from Sugar Cane. 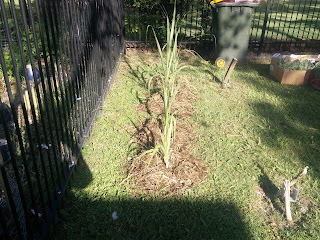 I harvested my first sugar cane today, only one stalk that was a bit under 6 foot long, I used a pair of garden shears to cut the base and will hope that it will grow another Ratoon from there. A friend and I then tried to crush the cane and extract the juice from the cane. We did not have any specialised equipment and tried using a meat mincer as that was about all we could find that would do. A meat mincer, is not ideal to use as the fibre in the cane very quickly blocked the mincer. In about 15 minutes, the two of us, with a lot of sweating, managed to extract about 200 ml of juice, from about 20 cm of cane. We then filtered it and then put in the fridge. We tasted the Cane Juice, and it was very sweet, and quite a refreshing drink. 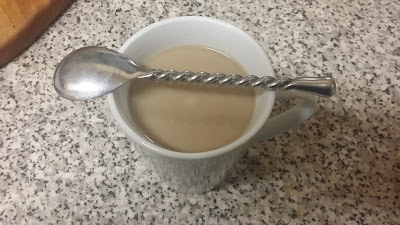 I have just made a coffee and added some Cane Juice into the coffee instead of Sugar, or Honey - although I usually do not add any sweeteners to my coffee. I can notice the sweetness in my coffee. I will not be able to crush the rest of the cane tomorrow, and since the sugar content drops straight away, I will cut the cane into billets and give them to a neighbour who wants to plant them. I will cut them up tomorrow morning when she is here with her 4 year old son, as he is the one that is keen on planting the Sugarcane, I will probably help them plant the cane in their yard tomorrow morning. I have officially started my Doctorate, as of yesterday (26 July 2016). It will take me about 3.5 to 4 years to do. My supervisory team is in place and we are ready to begin. My topic will be to create a locational model for maximisation of return from Bee Hives, by estimating the type and amount of honey produced. This is an area of research which so far has had little if any research performed on it. My internal project name will be '7ofBees', a play on 7of9 from Star Trek, as I will be integrating technology with Bee's. I will be setting up a blog for my doctorate at 7ofBees.com in the next few days. Ducks - Donald and his Family move on to a new farm. We have sadly decided that we will move our flock of ducks onto a breeding farm. This recent wet weather has made it hard for the yard to handle this number of ducks, and we were having to do a lot of supplemental feeding. I will also be starting my Doctorate very soon, which will be on Bees, so we will be getting more bee hives and hence the ducks will have to leave. It has been an amazing experience having ducks here, and once we move to a larger property we will continue to raise ducks again. 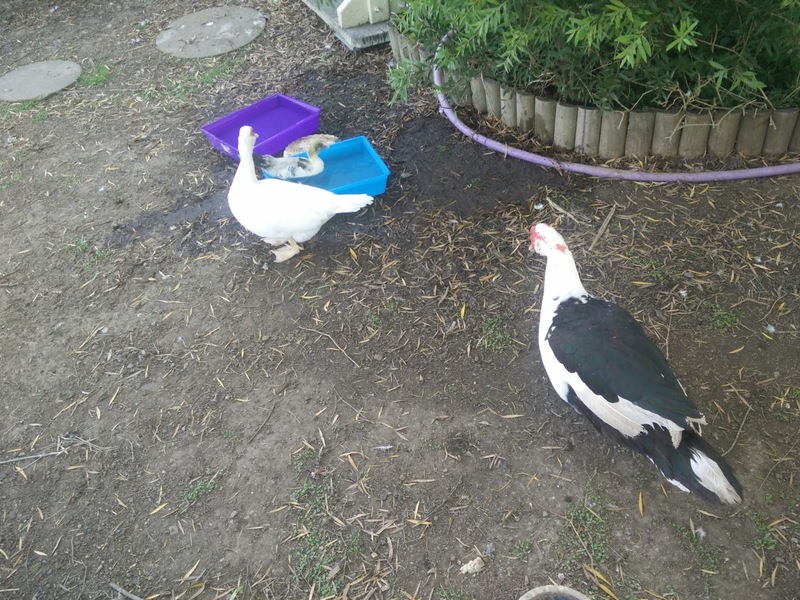 But the number of ducks that we want to keep is just not that practical in 1/2 a suburban backyard, the other 1/2 is for Spock our dog. We woke up Tuesday morning, to find a new batch of ducklings that the mother had hid pretty well from us, the mother and babies will move to the breeding farm. In spring, I will be getting a second Australian Native Bee Hive set up here, and will be using this one for much of my doctorate studies. 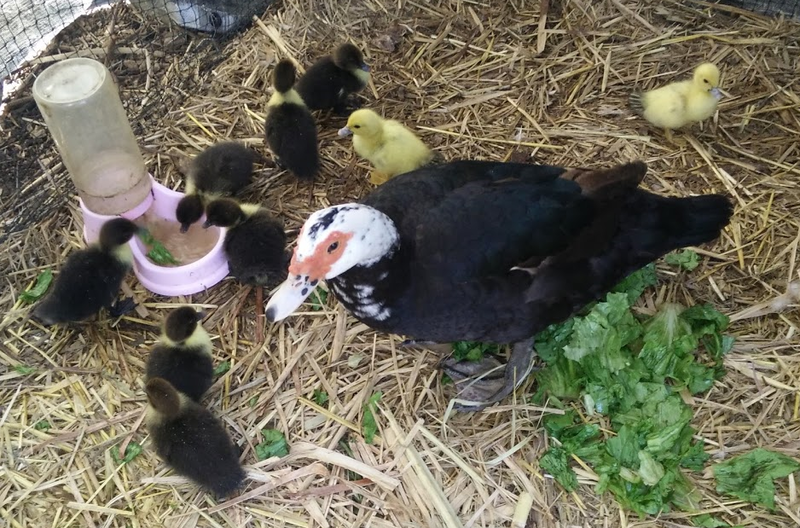 We are very happy with the breeder that we have moved our ducks on to, we have known him for several years, and when his staff have come here to pick up ducks, they are very gentle and caring towards all the ducks. They said that they will keep them together as one group and use them as breeders. There was 4 generations of ducks that had all grown together, and cared and looked after each other. The backyard feels a little empty now, without the constant noise and activity of the ducks, but Spock (our dog) is happy that he can get into the backyard again. We will miss seeing the ducks and interacting with them everyday, but we both feel that the time is right, and that we made the right decision of where to send the ducks. On Tuesday (19 Jan 2016) morning I witnessed an incident of animal abuse that is still making me upset. To me having animals is not a right, and should be considered a privilege. Our neighbour has a small friendly dog, that often breaks out of their yard, and into ours and plays with our younger dog (Spock), we don't mind when this happens, and we let them play for a little while and then take their dog home. That morning I heard a bark from the front yard, and thought the neighbours dog had paid us a visit again. So I walked out the front to check that he got in the yard OK. Instead I saw a 18 to 20 year old person, holding a dog up buy a collar attached to his neck, one foot off the ground, essentially hanging the dog. He was on the footpath in front of my neighbour's house, so I yelled [loudly] at him to stop what he was doing. He heard me, turned and looked at me and then ran off down the street. I was in my dressing gown, so I quickly changed and took off after him. Sadly, I did not catch the person, though in reality I was not sure what I would do if I caught him. My basic plan was to catch up with him, call the police (non emergency) and take it from there. If the police did not respond, try and get the persons details or follow them until they returned home, and then contact the RSPCA (Society for Prevention of Cruelty to Animals). Since I was not able to catch the person, I rang RSPCA and reported this person, so that if there was other complaints about him, there was a paperwork trail. I do not think I will see that person again, as I do not think he will walk down our street again. I went for a walk yesterday trying to find him (and capture some Ingress portals). Animals rely on us for food, shelter,protection and kindness, and if you are not capable of giving animal that - then you should not be able to own an animal. I have told several of my neighbours about this person, and they are also on the lookout for him. I recently planted two varieties of sugar came that were given to me by a good friend. I have yet to determine the exact varieties, but will do that as they grow larger. One is a commercial variant used to make sugar, the other is an eating variety. 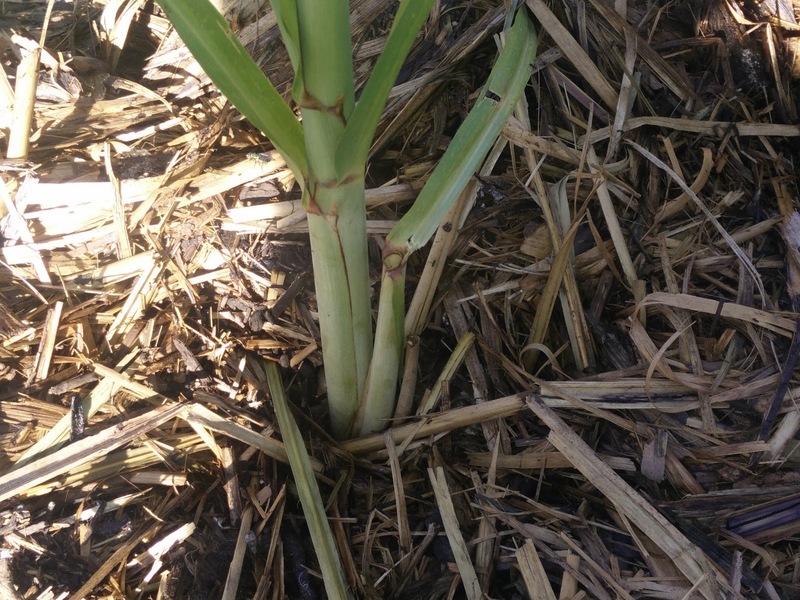 I want to grow sugar cane as part of my plan for the farm. So that products that the products as much as possible will come from the farm. For example for coffee, I will capture the water for the coffee from the farm, grow the coffee on the farm, the milk will come from cows on the farm, and sugar will come from sugar came grown on the farm. This crop of sugar cane will be a learning experience, as I learn the processes of growing and refining sugar cane. I put in 4 stalks of each of the two varieties, 3 of one type have sprouted, and two of the other type has sprouted. Giving me 5 plants. See pictures below. 5 Sugar cane plants in my front yard. I will not be refining sugar to crystalline sugar, I will be refining it to a liquid as it is very hard to make sugar crystals at non industrial scale. I will probably do some experiments with creating some crystals. 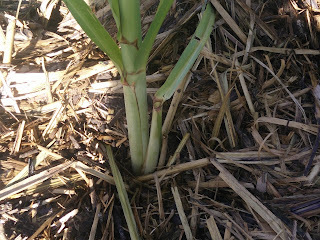 The sugar cane grew really quickly for the first 7 weeks, and are now over a meter tall, but it has seemed to stall in the last two weeks, it has thickened up at the base, and I have noticed that there are now side shoots on a few of the plants (See Image below). One Sugar cane plant is a clump of about 6 to 10 stalks. I think the plant grew rapidly with the nutrients that were already in the soil, and has used all of them, so I added some fertilizer to them. We cleaned the duck hutch today and removed the straw and duck manure, mixed in some composted cow manure, and added some worm compost water, and added it around the plants and gave it a good water. New Stalk to the side of the main stalk. I will be crushing the sugar manually from this first crop. As there will be such a small amount and some of the crop will also be used for replanting. I am hoping to he able to keep this 'stream' of the plant going for the foreseeable future to remind me of the friend that gave the original plants to me. We are currently starting some early stage research about how to make a sugar crushing machine to extract the juice from the cane. The left over husk of the plants will be fed to the farm animals. At the moment we will feed the left over stalks to the ducks, but eventually we will also feed them to pigs and other farm animals. Unfortunately I no longer have sugar in my coffee, so I will not be able to taste much of the sugar. I have enjoyed doing my MBA, and have decided to continue with my study. I will be undertaking a Doctor of Sustainable Agriculture. This consists of a year of course work, and then two years on a Thesis. I do not have to decide my Thesis topic, until the end of my first year. Determining nutrition load thus animal carrying capacity of fields from UAV's. Over the coming months, as I get time, I will do a post in a bit more detail about each of the above. 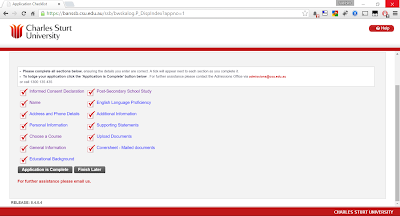 This is my completed application form. 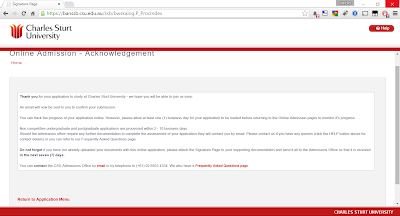 I am about to press submit. 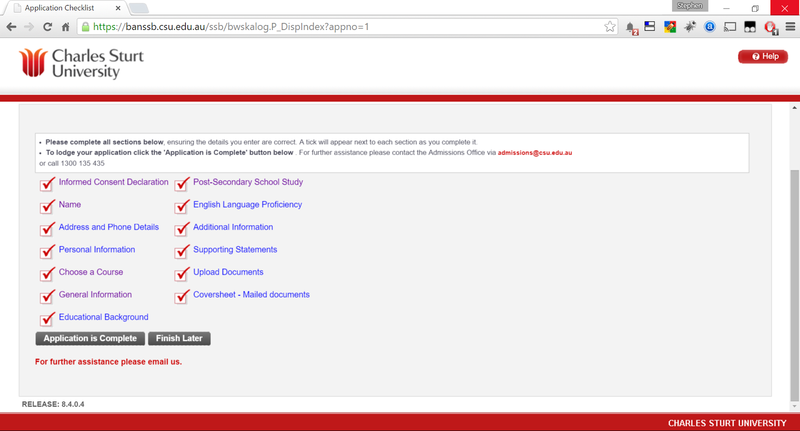 I still have to provide other paperwork, such as scanned copies of my degrees, although last time, that was not necessary. My wife has named the runt, I am not keen on naming them yet, as we do not know if it is a male or a female. It may be a male, that was intended for slaughter for the table, but now if it does turns out to be a male, we will have to sell him as an adult. We suspect that it is a female, and we will be keeping him and would eventually be giving them a name anyway. 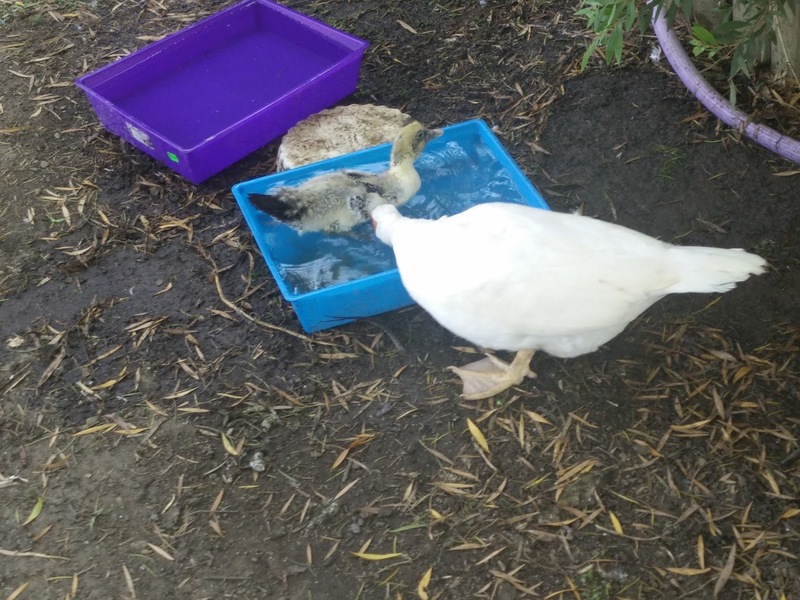 I was down feeding the ducks and noticed that the mini swimming ponds we use for the ducklings was getting a bit dirty - so I emptied them out, washed them and refilled them with fresh water. Pee Wee walked over and had a drink from the pool, and then proceeded to jump in for a swim, within ten seconds of him being in the fresh clear water, he decided to do a crap in there and dirty up the water. This did not overly surprise me as Ducks need to crap a lot, as they are flying animals and need to be able to get away from predators, so they have a very fast digestion system, and ducks crap all the time, all over the place :). In the photo below, you can see the mother duck (Crystal) - helping to clean the runt. This photo shows mother (Crystal) and father (Donald) - watch as Pee Wee has a swim. Yesterday we separated Pee Wee and gave him his own food and water so that he could eat as much as he wanted and was not pushed off his food, It seems the extra attention we gave him has done him good and he seems to be a bit bigger today, and more confident going in for the food, although we are still keeping an eye on him.